Summer has officially arrived, and the temperatures are soaring into the 100s! SunBird home sales for the months of March and April were even hotter than temperatures. Seventeen homes in SunBird sold in the month of March, and 24 sold in April. Welcome to our many new SunBird owners and residents! Realtors report waiting lists of people looking for homes in SunBird, and home values are increasing. For the first four months of this year, SunBird has had 54 home sales. SunBird is a great place to be! This summer, SunBird has several improvement and maintenance projects scheduled to keep the community up to date and progressing. Some of the projects planned include’s 1) Clubhouse third-level room and balcony addition/expansion project is scheduled to begin June 4. This project will be very complex due to the location of the construction. It is anticipated to be completed in October. Reports and pictures will be posted as it progresses. 2) Clubhouse main hallway men’s and ladies’ restrooms for two restroom stalls in each of the men’s and ladies’ rooms will be combined into one larger stall for better accessibility. 3) Stairway and hand railing from Waterview Road at the clubhouse to the upper patio will be repaired/replaced. 4) Road maintenance and improvement work in scheduled areas. 5) Veteran’s Memorial large aluminum monument sign to be installed in clubhouse honoring our many Veterans. 6) “SunBird Golf Resort” signs to be installed on corner of Riggs and Cooper Road exterior block walls to promote and make SunBird more noticeable. 7) Maintenance yard shade covering to be installed protecting the equipment and materials. 8) Completion of the security cameras at all vehicle entry and exits to SunBird. 9) Some new exercise equipment replacing and updating some of the older equipment in the fitness room. 10) New billiard tables replacing the 15-year-old tables. 11) The first phase of complete replacement of the common area landscape irrigation system. 12) Many other miscellaneous projects will also be made throughout the clubhouse. It’s going to be a busy summer! SunBird has many outside government agencies that oversee the health and safety of the operations, services, buildings and facilities. The Health Department routinely conducts inspections on the restaurant operations and swimming pools for safety. The City of Chandler Building Department conducts inspections on the buildings for structure safety and new construction projects. The Fire Department local crews inspect the clubhouse at least annually to become familiar with clubhouse exits and entries, location of fire equipment and the general area to be prepared for an emergency. The Fire Marshal also conducts more in-depth inspections with fire extinguisher tests, clubhouse fire suppression systems, signage and other potential safety and fire hazards. Recently, a new Fire Marshal completed a very detailed inspection of the clubhouse with a list of minor items that needed to be addressed. For example, the curtains on in the ballroom on the stage needed to be fire-retardant treated, a couple new lighted “Exit” signs and other items moved around for access. On the follow-up final inspection, the items had all been resolved, and all was within compliance. However, it was noticed that the fire sprinkler covers located in the clubhouse hallways needed to be updated. This project is also being currently addressed for updating. It’s good to have these oversight inspections to help protect and minimalize potential dangers or hazards to our clubhouse and services. 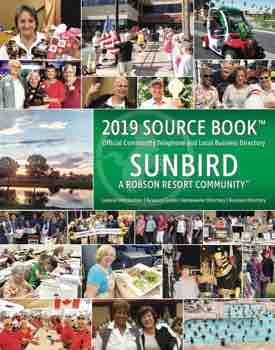 Last year, SunBird experienced a power outage that caused the clubhouse and many homes in the area to lose electricity. Since that time, we have adopted an emergency plan for the clubhouse in case of this re-occurring again. It was arranged with SRP that a text message or email notice would be sent to management, Patrol and a volunteer safety patrol immediately at the time of a power outage. Additional battery-powered emergency lights were installed, an emergency battery system for the elevator installed and procedures created to evacuate and secure the clubhouse. Most of SunBird experienced a short power outage again this past month. Many of the precautions worked great, and some need to be fine-tuned. The emergency lighting turned on in the clubhouse, the elevator lowered to bottom level and the doors opened, all of the vehicle gates opened automatically except for one. Patrol did a great job in securing the clubhouse and area. Fortunately, the power was only off for about an hour and all returned to normal. We appreciate all those residents who brave the hot summer months and all the inconveniences of the construction and improvement projects taking place. We are looking forward to a productive summer. Have a safe and cool summer!